I have a unique book to share with you today. You might be familiar with the hymn All Things Bright and Beautiful. Well, is that hymn written with gorgeous illustrations from Katy Hudson. 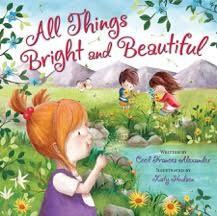 The book brings the wonder of childhood and exploration of this beautiful world God created for us. It is a stunning book and a true treasure! My favorite hymn is Amazing Grace.